In October last year, I went to the Big Bead Show - nothing too unusual about that. 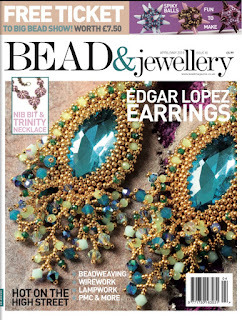 I had a lovely chat with Vicky Roberts, the new editor of Bead and Jewellery Magazine and she asked if I would be interested in designing something new and geometric for the magazine. Of course, I was interested! I decided to re-imagine my spike-balls, to include some two-hole beads in them to make them easier to zip together, giving them a different look. 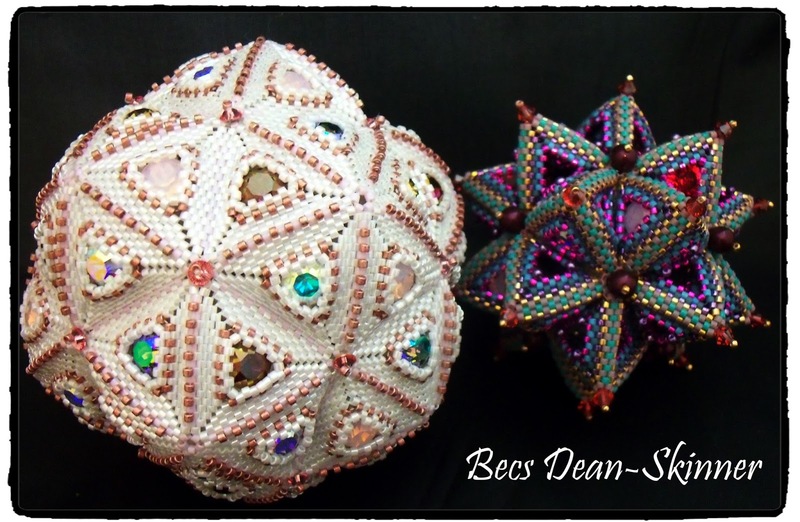 They are made from twelve spike beads, each set in a pentagon - making a dodecahedron. These spike balls are made entirely using 'traditional' seed beads, with crystal embellishments. 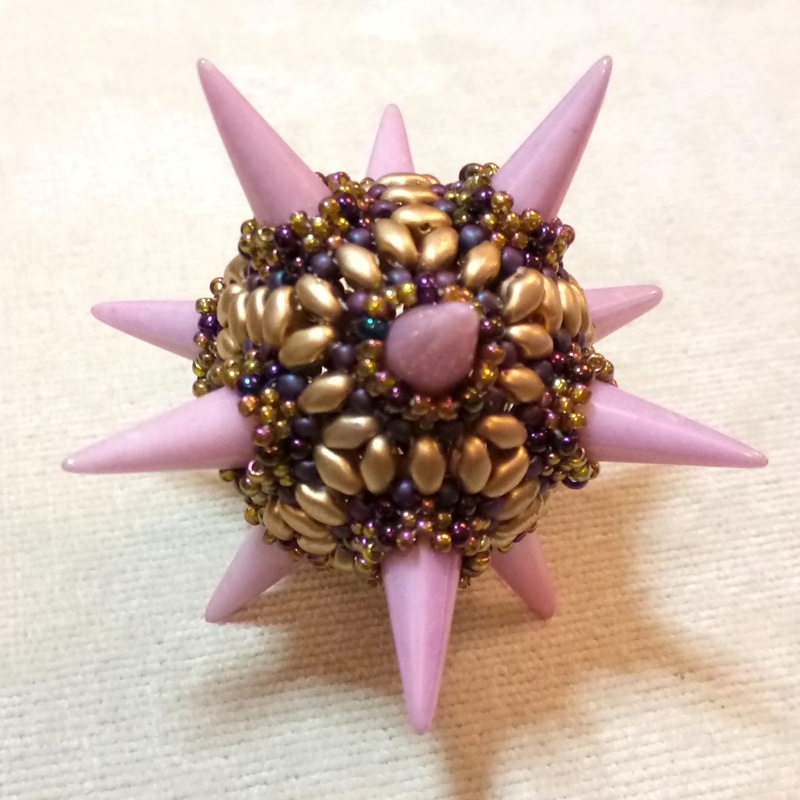 The tutorial for these spike balls is available in my Etsy shop. When I initially designed these spike balls (back in 2012), two-hole beads weren't readily available, and I certainly hadn't considered designing with them. Now there are so many choices! I chose to use miniduos when re-imagining my spike-balls as they're the smallest of the two-hole beads, and they fit in nicely with the size of the beads I had used in the bezels. These spiky balls, (named 'Unicorn Balls' by a friend of mine) have been published in Issue 85 of Bead and Jewellery Magazine. The team at Bead and Jewellery Magazine liked my design enough to decide to put it on the cover of the magazine! I was so shocked and delighted when I saw it, I actually squeaked! The second generation of spike balls are slightly larger than the first, and the way the miniduos interlock and form triangles at the corners makes them a slightly stronger structure. 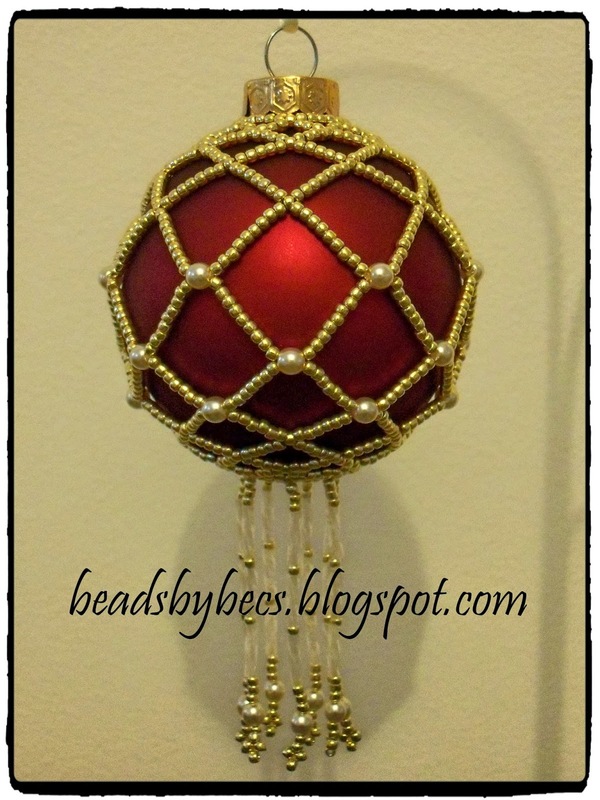 I love the way that beading is so versatile that you can re-engineer a design to accommodate new bead shapes and techniques. That's no moon.... it's a space station! Oh dear, it has been far too long since I last blogged - I am so sorry! 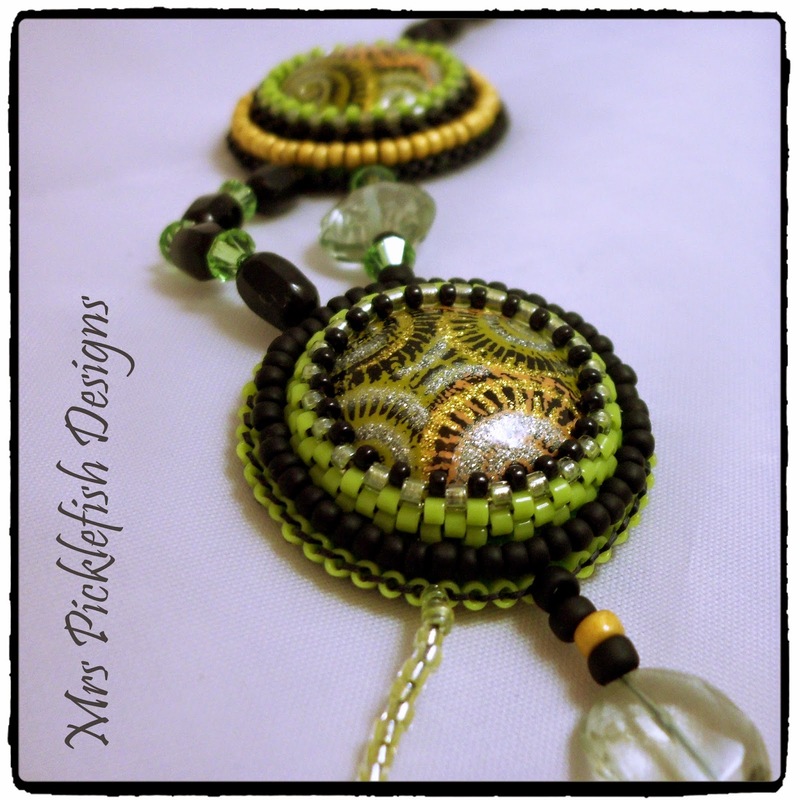 I have been wanting to blog about a piece of beadwork I made for quite some time (I actually finished it in January), but I had to wait until the judging of a competition before I could publicly share it. I decided to take part in the Beadworkers Guild Crystal Anniversary Competition; it was sponsored by Swarovski, so it had to be something bling. 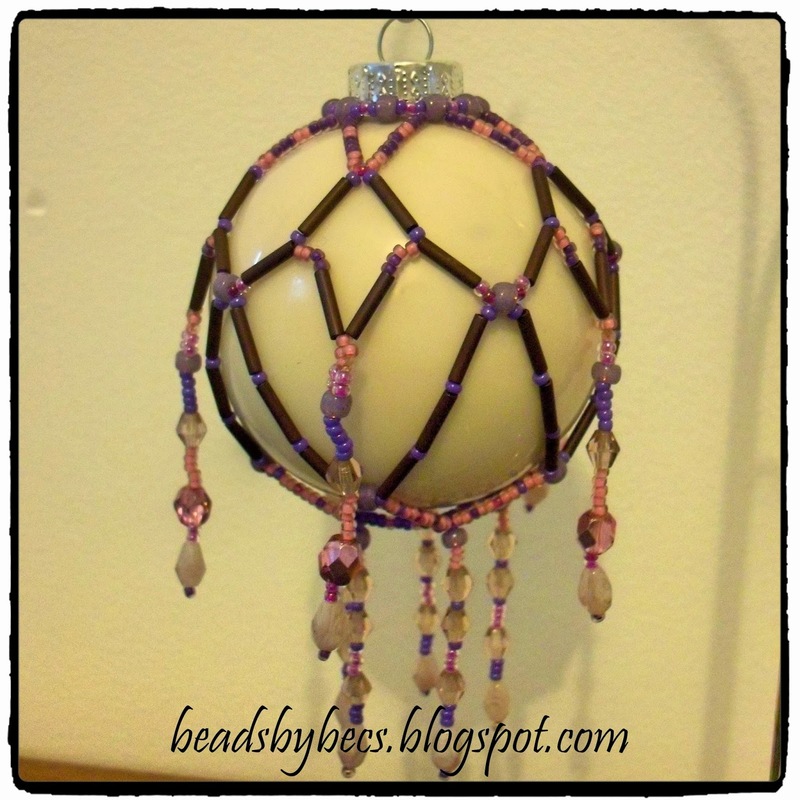 I'm not often a very sparkly beader - I have the odd moment when I go crazy with crystals, but usually, I'd prefer pearls. After my first geometric beaded sculpture being accepted as a finalist at the British Bead Awards, I decided to make another piece along the same lines. Still 60 triangles, but joined together in a different arrangement, to make a stellated dodecahedron (a round(ish) structure made from 12 pentagonal pyramids). To show off the crystals to their best, I decided to make the majority of the structure from white delicas. Buying delicas in 50g packs was something quite new to me... it felt very odd! To complement the white, I added a pale pink (think coconut ice) and a matte copper to embellish the edges of the triangles. I chose five different finishes of Swarovski chaton to include, and a generous sprinkling of Swarovski sequins to add some shine to the vertices. As my first geometric structure ended up with a nickname (sixty flippin' triangles), this one did too - I jokingly started calling it The DeathStar (I am a secret sci-fi geek). When I had finally finished making it and stitching all of the triangles together, it was so close to the deadline... I only just made it! I took some photos and submitted them, and I was honoured to find I had been selected as a finalist in the competition. The Beadworkers Guild website has a gallery of all of the finalists and winners.There is some incredible work on display in the gallery, it is well worth checking out. I wasn't selected as a winner, but I am grateful to have got through to the final round of the judging. Here is my DeathStar... It's so nice to have it back, proudly displayed in my living room. Ok, so the second one I couldn't control all that much, but I've managed to keep it so far... despite investigations to exclude bladder cancer. I've got the all-clear... phew! So, learning to knit properly. I've included 'properly' in this as I could just about knit... not really purl, I certainly could do any shaping. I started a little early (between Christmas and new year), and bought myself a Craftsy class - Knit Lab, by Stefanie Japel. Hours later, I could cast on, bind off knit and purl... I could increase and decrease in many ways and I'd made a lacy scaflet! So, what to knit next... I though a scarf and hat would be good... not matching though.... I'm never that co-ordinated! 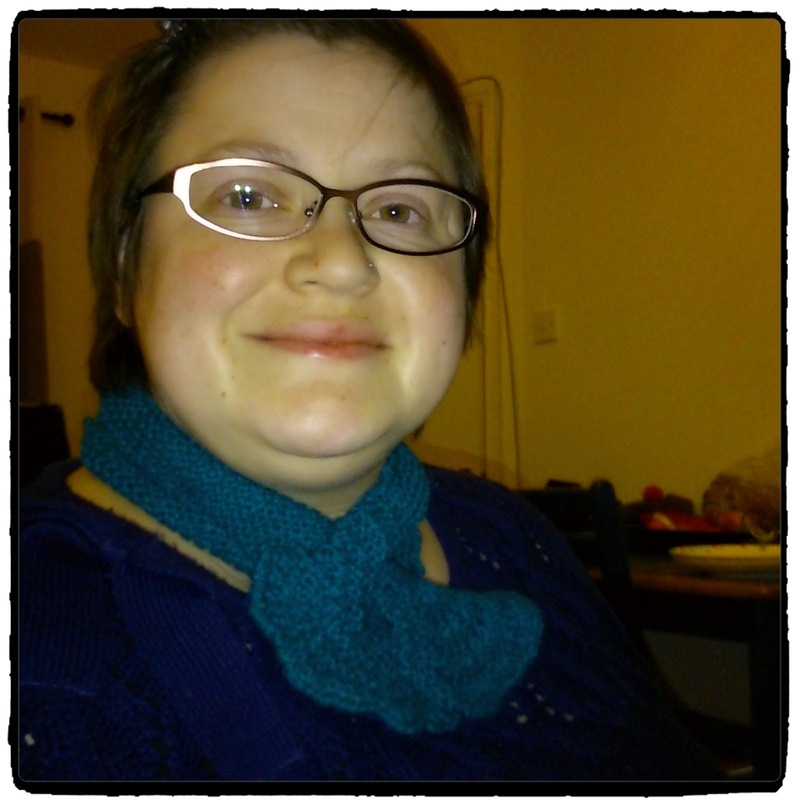 The scarf is bamboozle yarn, it's thick and thin in places and has the most amazing mix of colours. It reminded me of spring, and was a great excuse to practice stockingette stitch. 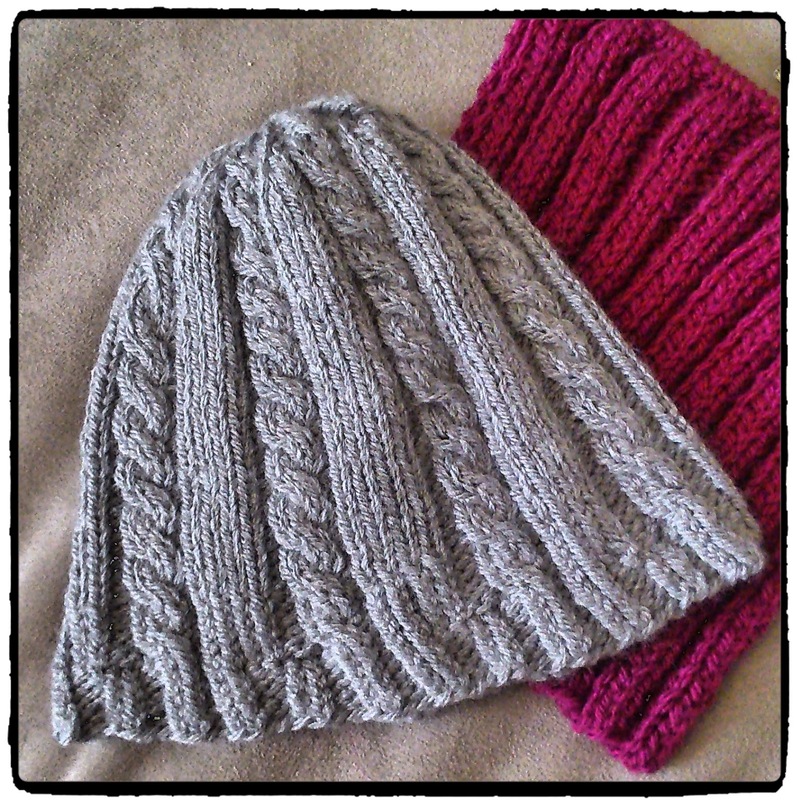 The hat was worked flat in Sublime cashmere, merino and silk blend and stitched up the back. It's cosy and soft and lovely to wear. 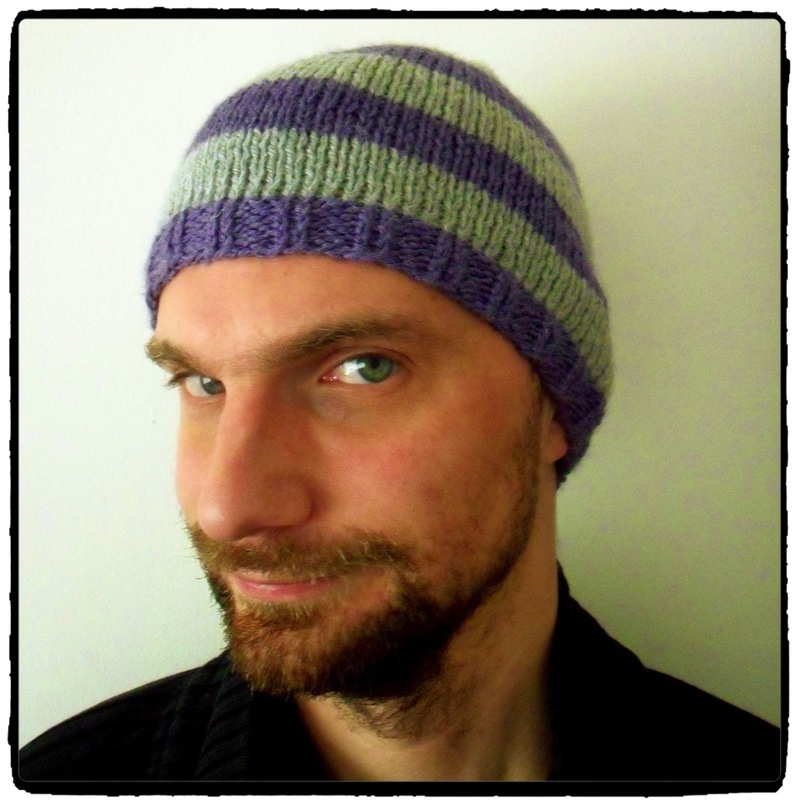 As my husband has a love of funky hats (he wears a hat every day, whatever the weather) I thought I'd knit him a stripy one (to practice changing colours). He loves it, although it's not as warm or distinctive as his usual head-wear. My next victim (or recipient) was my niece... she is a gorgeous little girl, always smiling... this was my first attempt at using double-point needles, knitting in the round. It was made using the left over cashmere, merino silk blend that my hat was made of... and the pompom on top was made from the left-over bamboozle. Next I decided to tackle cable knitting... after a couple of practice squares, I moved onto another hat... this one in grey aran wool/acrylic blend. 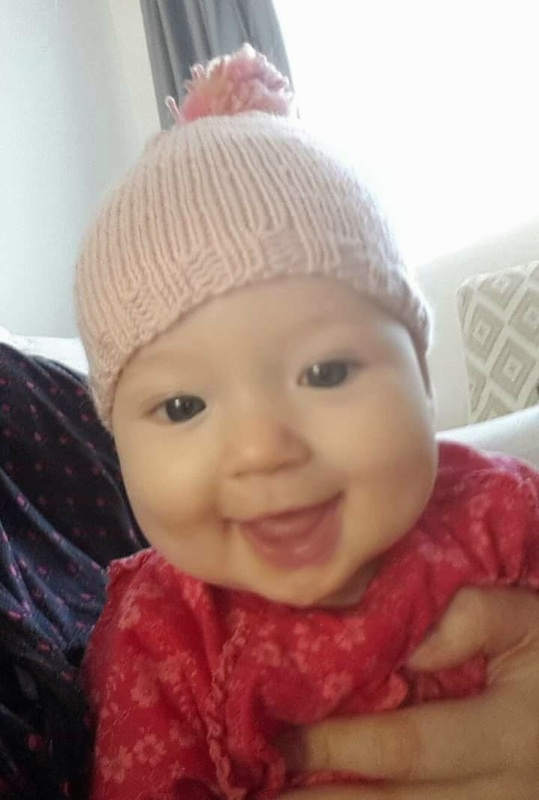 So, after all that, I thought I should probably make a garment of some description... and I didn't want to start a massive project knitting for me (plus-size knitting takes a lot of time and a lot of yarn); so I opted for something for my niece again. 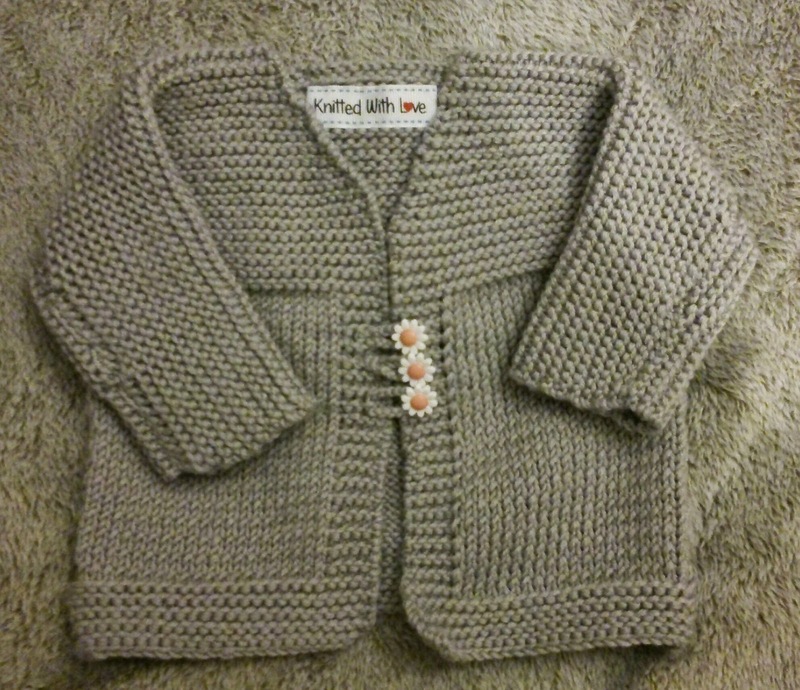 This is a kimono-style cardigan, designed by Mary Kate Long. Again it is made in Sublime, cashmere, merino and silk so it is lovely against the skin, and I finished it off with cute little flower buttons. 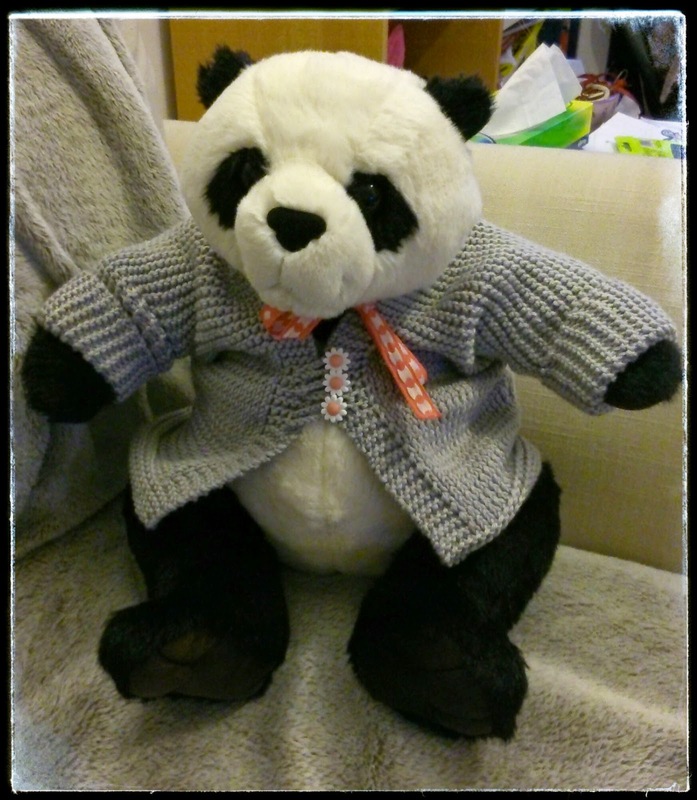 My pet-panda, Barry, decided he wanted to model it, but very soon it will be worn by my niece... I just hope it fits!! 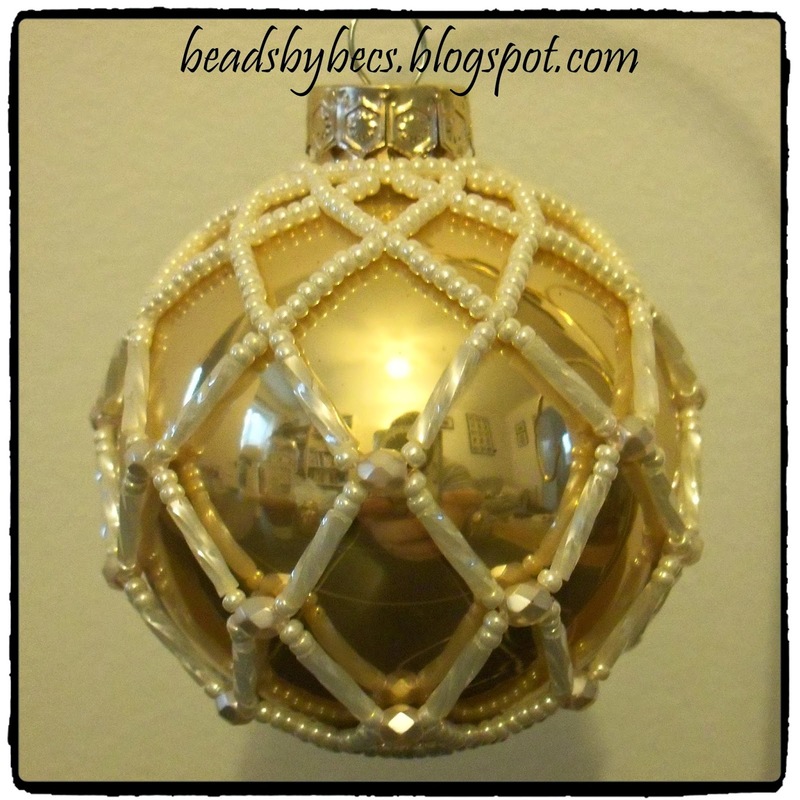 I love beading beautiful but quirky, whimsical things; Christmas decorations are right up my street! 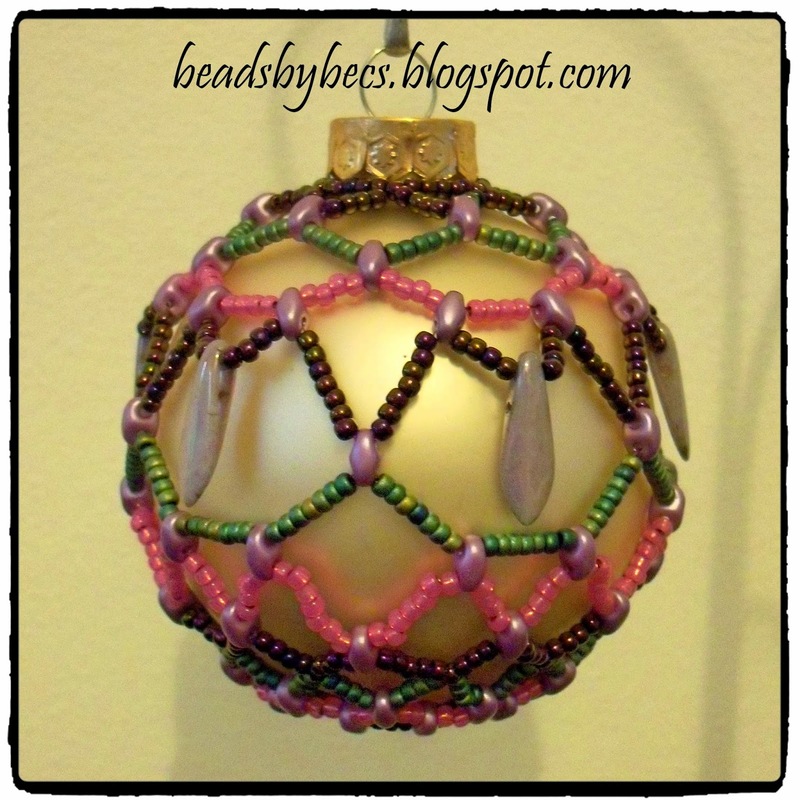 As it turns out, I really enjoy beading baubles, and it seems that they are very popular. I am selling them as fast as I am beading them (sometimes faster!). 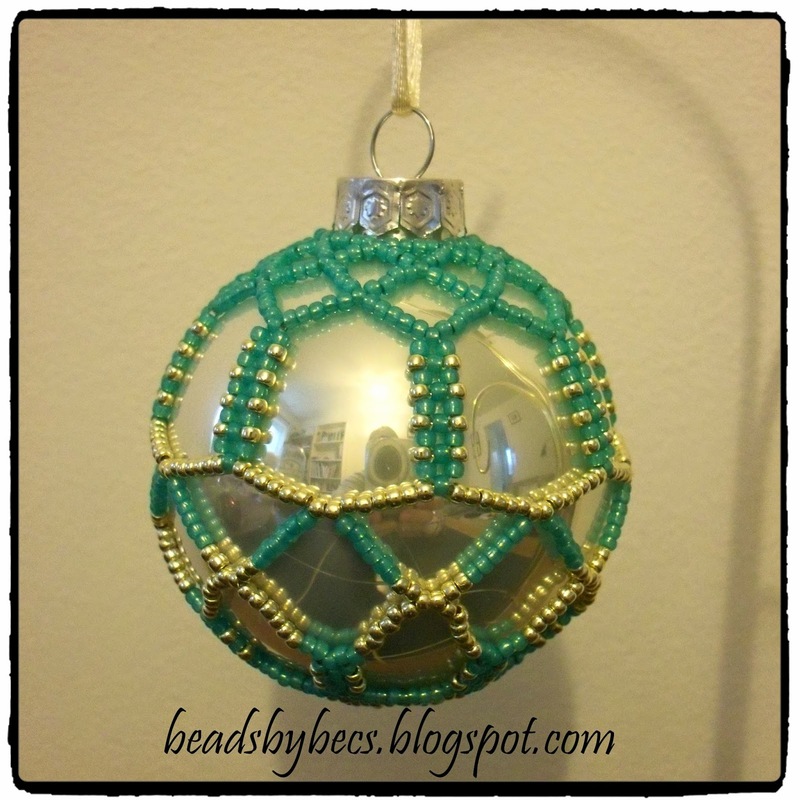 So, here are photos of the baubles I've beaded recently.... I'd love to hear what you think of them. Unless it says otherwise, these baubles are for sale for £10 each (+p&p - UK addresses only). I've been very quiet on my blog for a very long time - I had been blogging a little on my sister-blog (mrspicklefish.blogspot.com), but I've not had a great deal that I can share with you all... 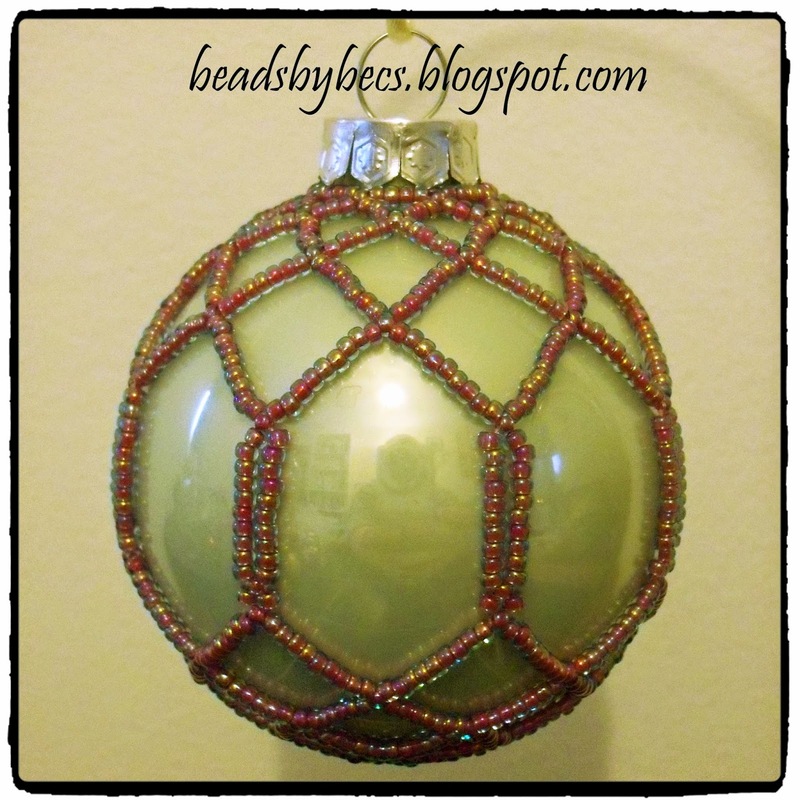 I have been beading in secret! Usually, I get so excited about what I make that I just want to share it with everyone, so making something for a competition, where the entry has to be anonymous is very difficult. 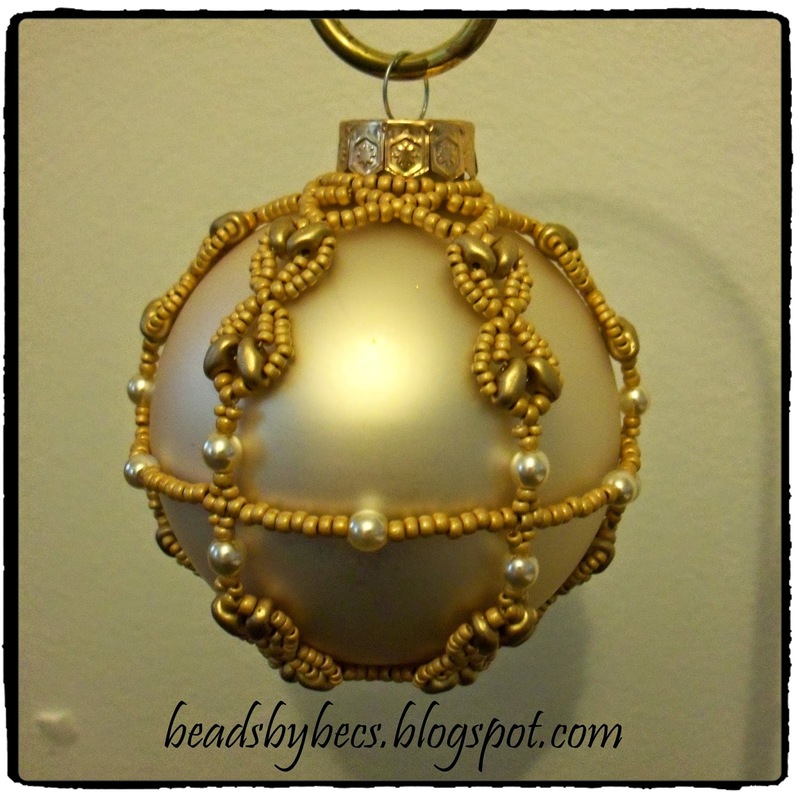 I have blogged before about competitive beading, and how I find it a bit of an odd concept, but I recently made something that I would be willing to submit to a proper beading competition. 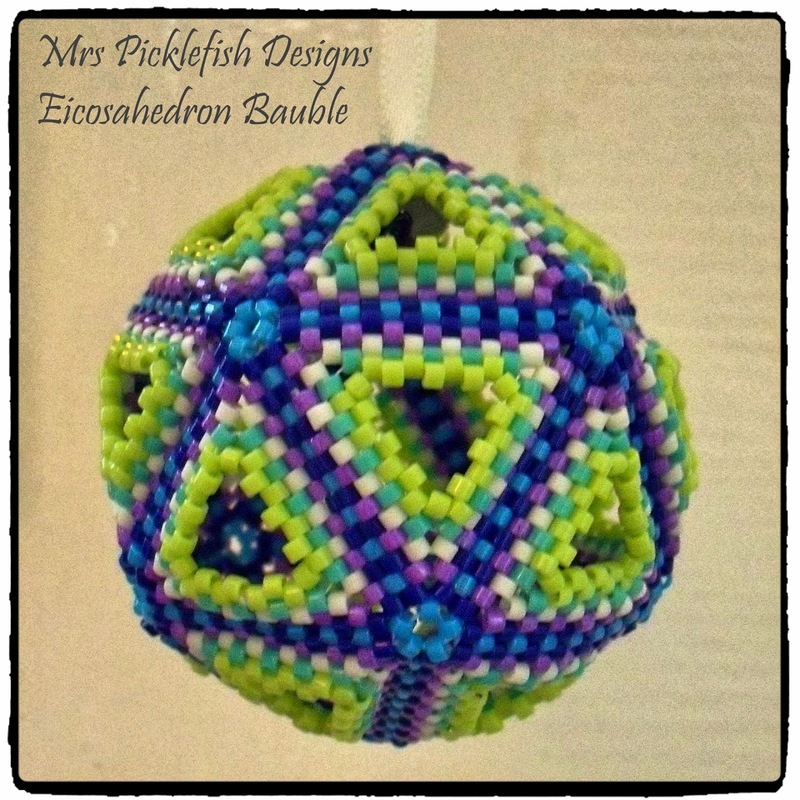 In the summer, I started playing around with triangles, making eicosahedra (or icosahedra). 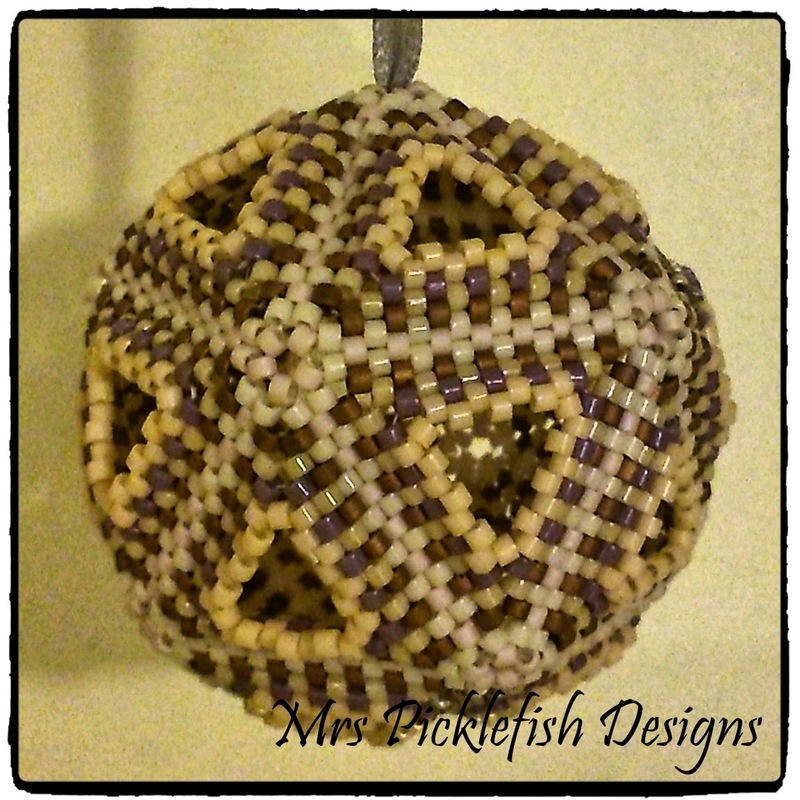 An icosahedron is a platonic solid, made up of twenty equilateral triangles, so I made a couple using peyote stitch. This was my first colour selection - I love the bold bright colours and the contrast of the lime green with the blues and purples. I made a second in pastel tones, which looks a lot more subtle, but is just as pretty. I do confess to being a bit of a geek when it comes to geometry, so I wanted to see where I could take this idea next - so a stellated icosahedron seemed like the next logical step (of course)! Stellated means star-like, so instead of making a smooth ball, it would be spiky - like a 3D star. Of course, spikes mean more triangles and more beads.... so I stocked up on some delicas and decided to throw some crystals and pearls in the mix too. 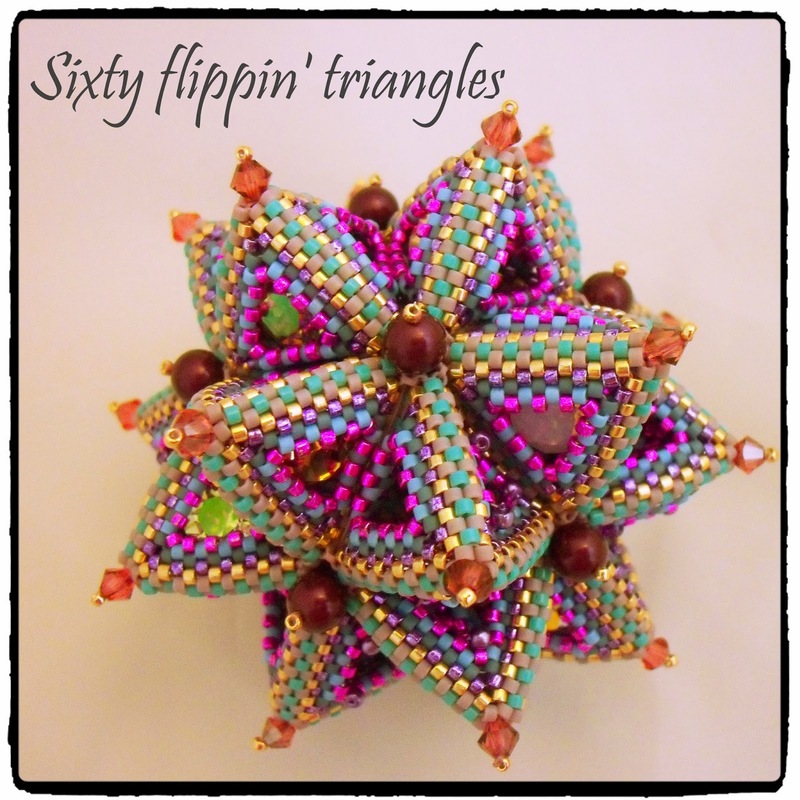 I stuck with the bold colour scheme, but in metallic finishes, and set about to bead sixty more triangles. 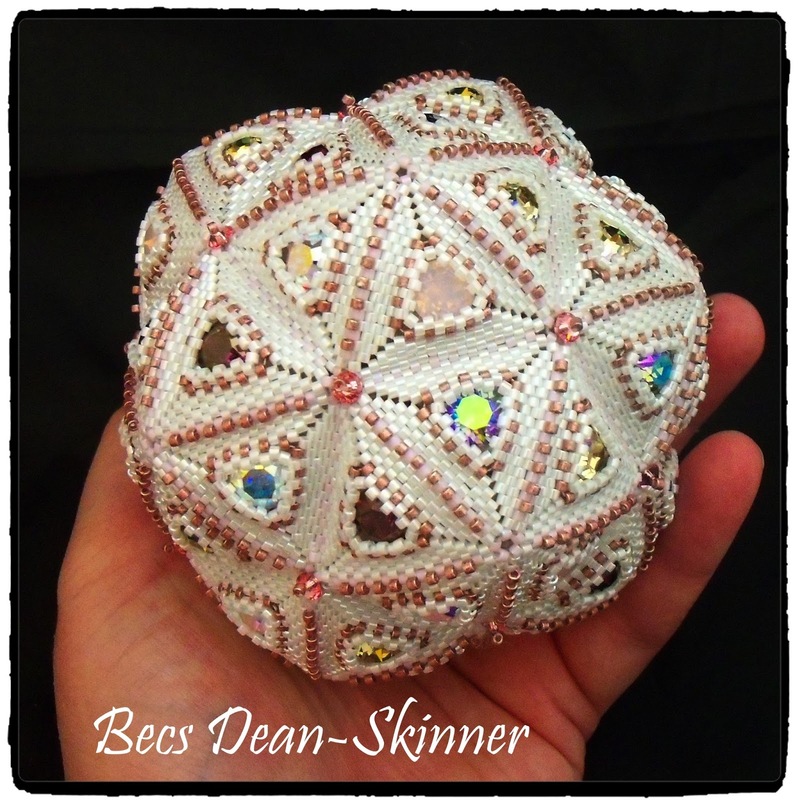 You'll soon understand why my stellated icosahedron very quickly got named "Sixty Flippin' Triangles"
The resulting ball of beady spikes was something I was very proud of, and ultimately, I decided to enter it into the British Bead Awards. 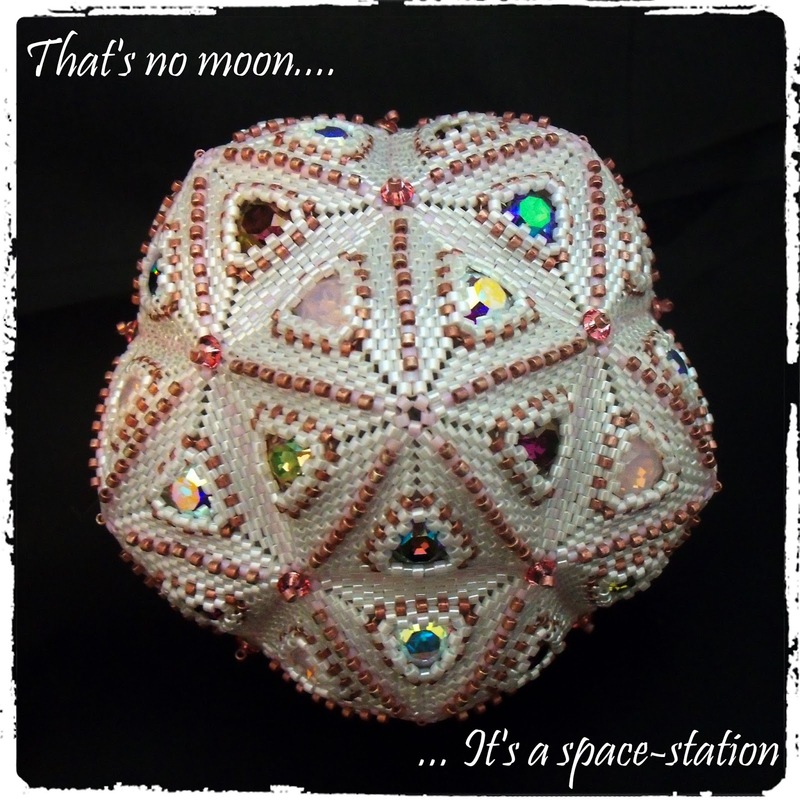 I entered it into the 'Beadwork - Non-Jewellery' category. 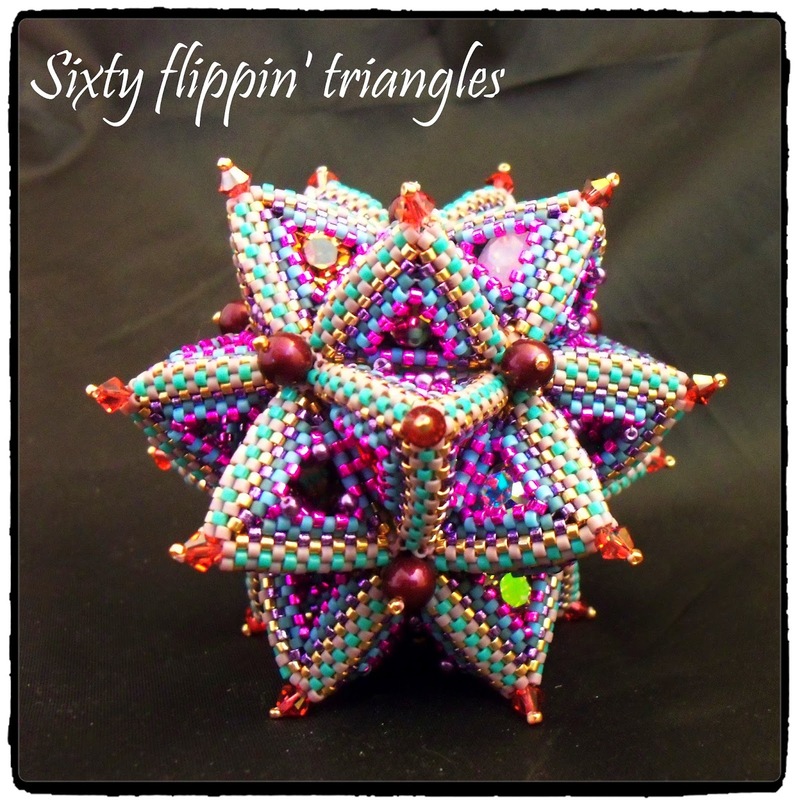 So, my sixty flippin' triangles got sent off to be judged 'in the bead' against the other finalists... and I was invited to attend the award ceremony at The Big Bead show in October. It was an absolute honour to see my beadwork on display and to overhear people discussing it, but unfortunately, I didn't win any awards. I'm not deterred though - this journey of making geometric shapes out of beads has really sparked some interest in me, and I think I am now beading my 126th triangle of the year - keep your eyes open for more of my geometric bits and pieces! Bowls full of beads.... or bowls made of beads. Either is good with me! My slight obsession with beads means that I often buy beads when I don't actually *need* them. Well, who does actually need beads...??? So, I bought some big tubes of bead soup a while ago, I think I ended up with 6 tubes of 24g of miyuki bead soup - just size 11 beads... nothing fancy, but some gorgeous colours. Quite often I sit down with some beads with no idea what the finished product will be and just 'doodle' with beads (or beadoodle, as I like to call it). I didn't have a plan when I started off with this, but I ended up with a bowl, looking rather like this! It's a little flexible, but holds its shape nicely, with a rolled-edge at the top for stability. It measures about 7.5cm across at the top. 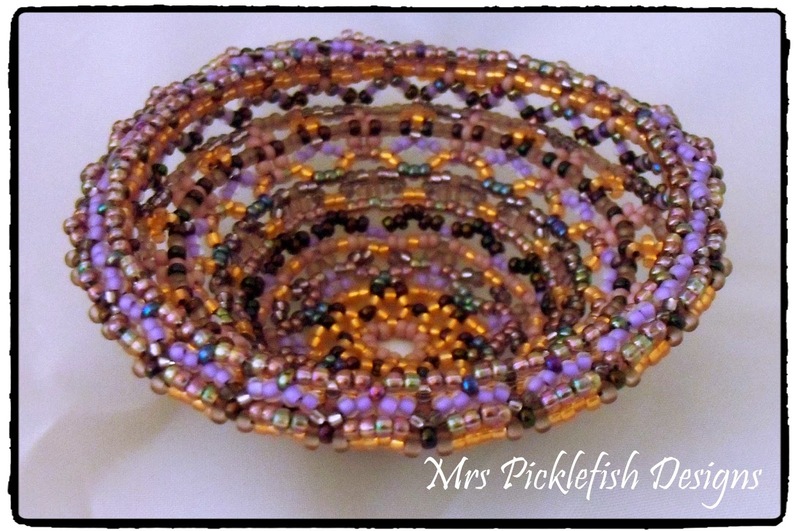 The bowl is made using a mixture of peyote, netting and right-angle-weave - it's quite a multi-stitch project, but it has been great fun to make. So much fun in fact, that I made three!! I'm not sure they actually have much of a practical purpose, due to the holes in them, they're not massively useful for storing beads... but they are quite handy for putting earrings in at the end of the day. 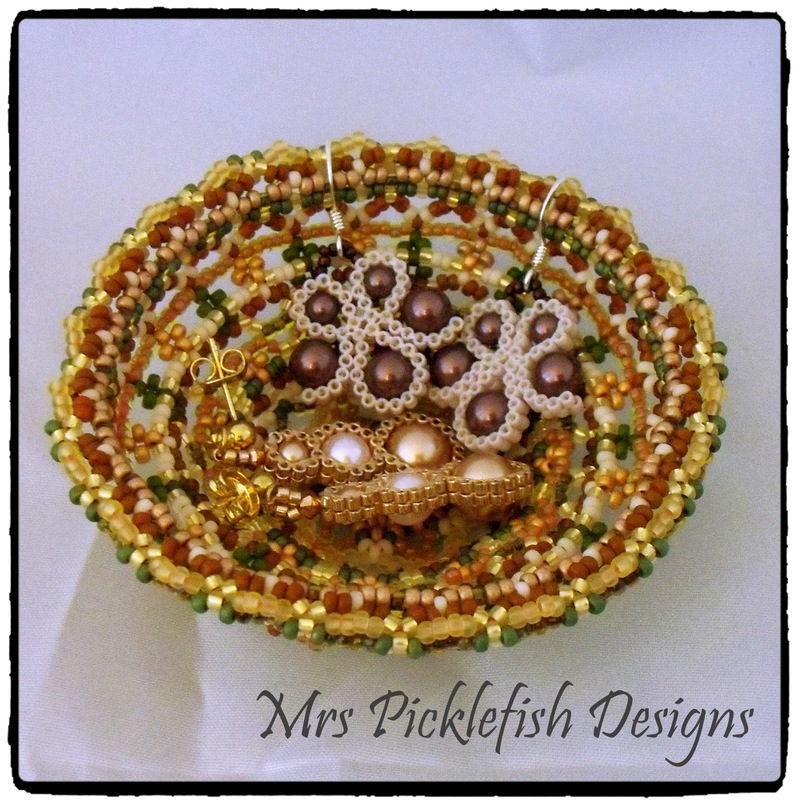 The earrings in this little bowl are made using bead quilling techniques - the pinky ones are designed by Kathy King, and the golden ones are my design - published in Bead magazine in December. 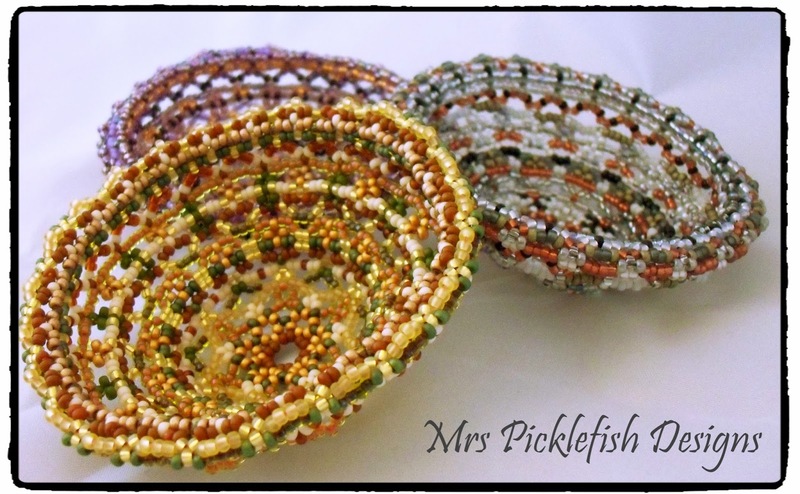 I plan to write a tutorial for making these cute little bowls... I'd love to hear what you think about them. As a beader, I've always shied away from fringing. Don't know why - it's just one of those things that I've been fearful of. In the last few months, I've got over my fear of it. 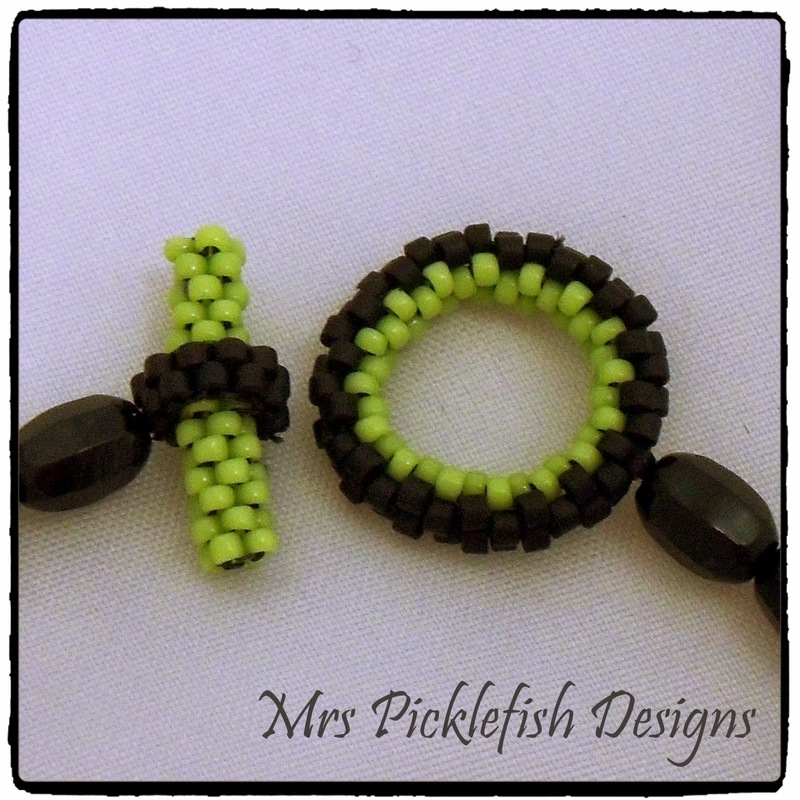 Another thing I've never done, is make individual bead embroidery elements and link them together... until now! Before Christmas, I bought some gorgeous vintage cabochons from a shop called Rosebudlia; she sells a beautiful selection of cabs and other goodies. I decided to put these cabs to use for another beading first - joining embroidery elements. I decided that five elements would look best, and surprisingly, I had the right colours in my stash, so this was quite a stash-buster too! 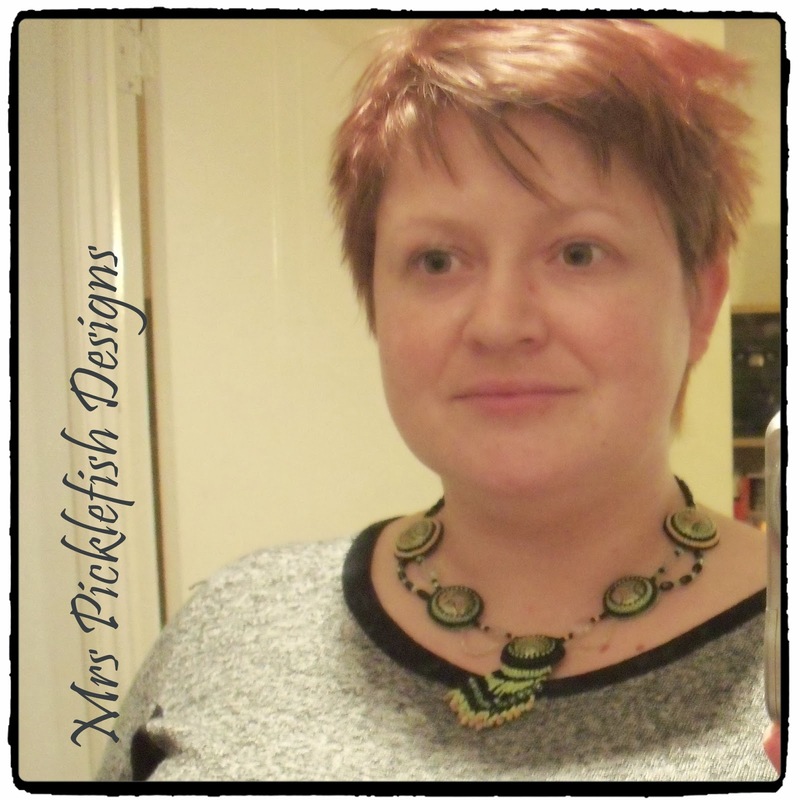 This is what the finished necklace looked like, and here is me wearing it - so you can see how it sits. It's just my opinion, but when making a piece like this, involving no metal components in the design, the best way to finish it off is to make a beaded clasp. 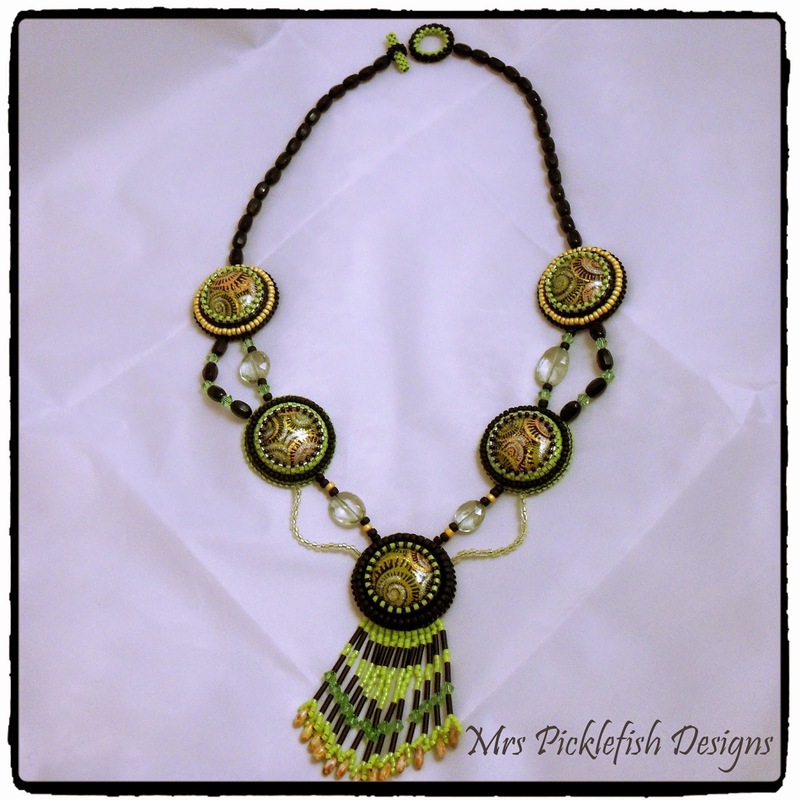 I love beaded toggle clasps - and the circular motifs in this lend themselves to a toggle clasp. 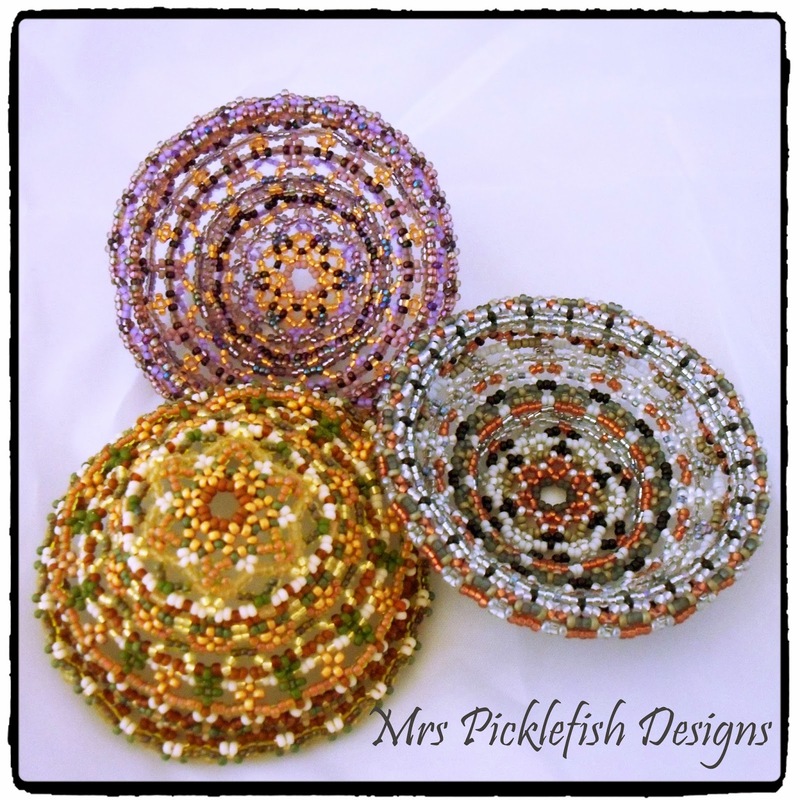 This shows a close-up of the beautiful cabs I used - they reminded me of ammonites, and the little bits of glitter in them give them a bit of sparkle. One other slightly odd thing about this piece is that I actually used bugles in it. Usually I don't use them as they are often sharp at the ends and can cause threads to fray and break, but these matte ones are very nice, and they work well in fringing. 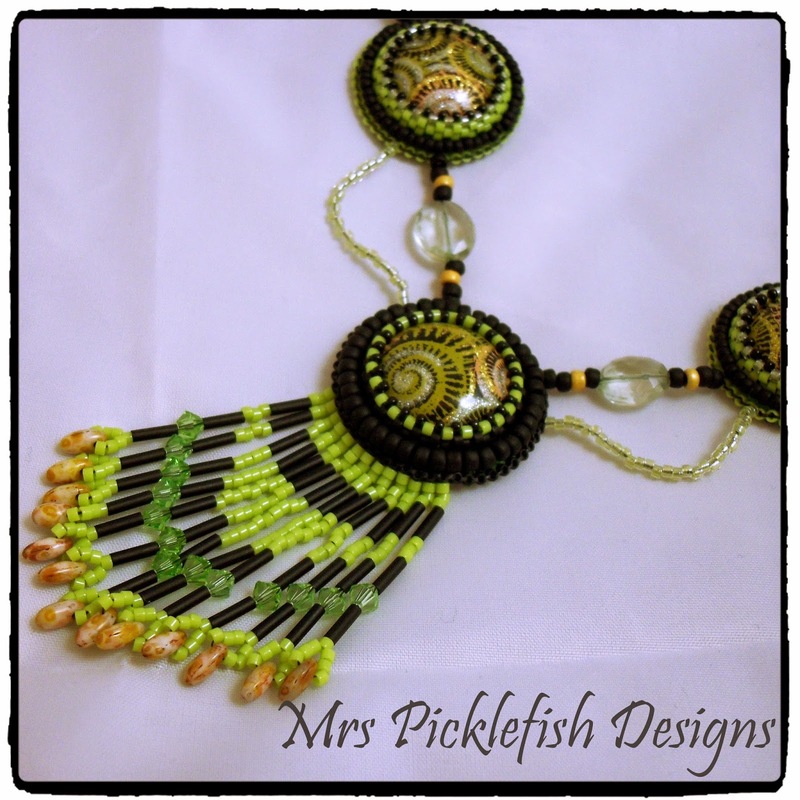 I'd love to hear what you think about this latest piece of beading... I'm very excited about it, and I'm looking forward to using this technique more.